Whether you are new to the area, a native, or anything in between, one of the best parts about being in Portland are all the interesting, fun, and beautiful things to do. Since the weather and activities are ever-changing (and you inevitably have tourist friends who force you to visit the sites you never seem to get around to), it never hurts to reevaluate your checklist every now again of things to do in Portland. Here are a few suggestions for passing time in the winter months. 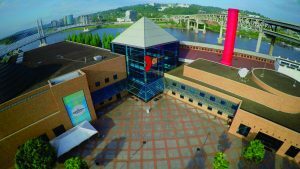 Although primarily geared toward children, there’s something for the curious child in all of us at OMSI, the only museum with a submarine docked out back (and available for tours). Located in a sprawling former sawdust-fired power generation plant, this historic downtown structure along the Willamette River includes a planetarium, interactive exhibits, and labs, which are fun to peruse with children of all ages, while their giant screen theater shows a mix of “Hollywood Movies” and educational documentaries, with the occasional QA and special event. They offer camps and classes throughout the year, but one of their biggest draws are their Attractions, usually national or international exhibits (currently they are hosting the King Tut exhibit). For adults, their bi-monthly “OMSI After Dark” events are known to provide an intriguing adventure. This Northwest chain of brew pub restaurants, theaters, and hotels was started in 1983 by brothers Mike and Brian McMenamin, who now own and operate more than 50 establishments throughout Oregon and Washington. Best known for reinventing historic buildings with colorful, fanciful murals and repurposed spaces, as well as delicious food and craft brews only available at their establishments, they are also invested in local history, and are probably the only brew pub chain with their own staff historian. As implied, the McMenamins Kennedy School location is housed in the former Kennedy Elementary School, and includes a large restaurant, several bars, a quirky movie theater, soaking pool, regular live music and events (such as a monthly historical society presentation featuring local experts, which typically sells out their theater), and a hotel. 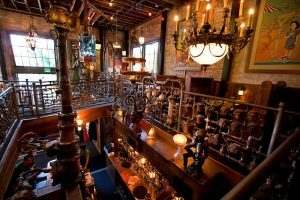 Their infamous Boiler Room bar is located in the updated furnace facility of the school, decorated with vintage piping and aplomb. Roam the halls, imagining school children of days past, enjoy classic McMenamin’s artwork and interesting use of a piece of Portland history. Located in the north east area of Portland, you’re also a stone’s throw from the Alberta Arts District, NE Mississippi, and relatively close to the airport, making this a good place to stow out-of-town guests. Located in downtown southwest Portland, Portland Art Museum is the oldest art museum on the west coast, and the seventh oldest in the US. Over time, it has been expanded into 112,000 square feet of rambling wings, mezzanines, and basements, with significant exhibits dedicated to Native American, American, Asian, European, Photography, Graphic, Modern and Contemporary art, as well as an impressive impressionist exhibit featuring several Monets (which includes an amazing piece from the Waterlilies collection). If your trigger finger is itching to blast some asteroids or jump over barrels, or perhaps you are feeling compelled to lance agile opponents from the back of a large-ish bird, or pilot a yellow disc through a harrowing dine-and-run maze, or any other number of classic adventures of decades past, the good news is your cravings can be fulfilled at Portland’s Ground Kontrol classic arcade and bar. 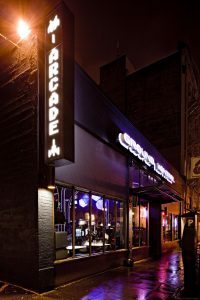 Having recently expanded, they now boast over 150 games available for play, with the biggest lineup of pinball in the Portland metro area. Two full bars are available all day, including 20 taps and a variety of local brews; tournaments, parties and events such as a regular stand-up comedy show, and DJs are regular features on their calendar. Families and minors are welcome from noon – 5pm daily. To round up this collection of entertaining Portland adventures, we’re recommending you take a trip back in time around one hundred years. 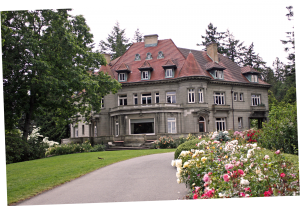 Constructed in the early 1900s for himself, his wife, and their grown children and grandchildren, the Pittock Mansion was a culmination of one of Oregon’s earliest leaders’ successes in the form of an incredible abode with an unmatched location. The eventual and lasting result of his success with businesses such as The Oregonian was a dwelling where he could enjoy the beauty of architecture, art, and outdoors, while surrounding himself with his family in a luxurious location with all the modern amenities of the time. The house was later purchased and restored by the city of Portland, now run by a non-profit dedicated to its preservation as a public museum. If you decide not to tour the house, you can still enjoy the lush gardens and beautiful views of the city and surrounding area, or take a short trip through the adjacent Gate Lodge. Drive up to the house or take the scenic route via a moderate in-town hike from Macleay Park. During the holidays, the mansion is lavishly adorned with period decor. Bridgetown Moving and Storage provides services throughout the metro Portland area. Contact us for questions or to receive a quote.